Getting older is a pain in the you-know-what. Having entered my 8th decade last month and gone back to work four days a week two years ago, I have reluctantly faced the need to ratchet back a bit. Or, as we say in the corporate world, it’s time for downsizing. Now that daughter dear and our son-in-law are store owners – which is a seven-day-a-week job – they have very little time for ranch projects. The Big One is out of the house, The Middle One will graduate from high school in three years and The Little One is 12. TLO is the only one we’ll be able to count on for assistance for any length of time. We have to think about what we can handle essentially alone. 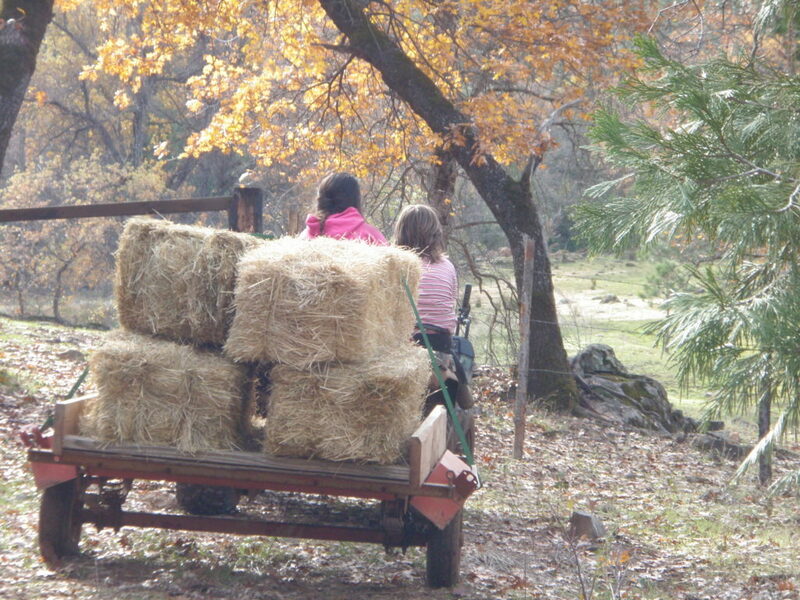 TBO and TLO helping with chores in their younger days. The first thing to go was writing for pay. When writing was my main source of income, it took up a lot of time. Research, draft, write, proof, final check, post and sometimes revise – it all added up. But it was a reasonable living, was work that could be done while it was still dark outside and fitted into odd moments of time between various chores on the ranch. I still do some writing, but it’s an income supplement instead of the main event. However, once I do retire (again), I’ll probably be picking it up, so I’m keeping my hand in and staying with previous clients in a more limited fashion. 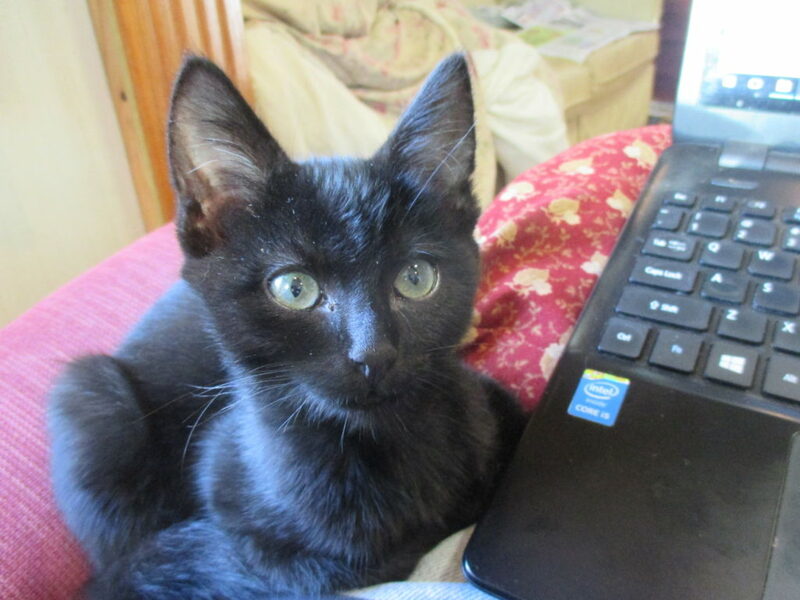 Radar the BatCat “helping” Mom write. He still does, but he takes up a lot more room. Although I didn’t do it on purpose, we lost Maybelle the milk cow a couple of months before I went back to work for what I thought would be a six- to eight-week stint. I helped find, hire and orient a new clinic nurse manager and came back to be a ranch wife who happened to be bottle-feeding a calf twice a day. Six weeks later she quit (the new nurse manager, not the calf). No good candidates on the horizon, so back to the clinic I went. I was still thinking temporary and had hopes for Violet as a house cow, but I was also keeping an eye out for a good milk cow. There were lots of things at the job I thought could be made better and I was having fun. I eventually realized I wasn’t really ready to hang it up for good and instead of staying on as a consultant, I became an employee. I’m still looking for that milk cow, but I’ve also come to realize we have to have fewer cows. So we’re selling off the beefers or bartering cows for help in major projects hubby can’t do on his own anymore. This means less hay and water hauling, less time on daily chores, etc. If I’m just dealing with one milk cow plus her current and yearling calf, that’s doable, probably well into my older age. We may even get down to where we can rotate them through the various pastures and stop feeding hay entirely. 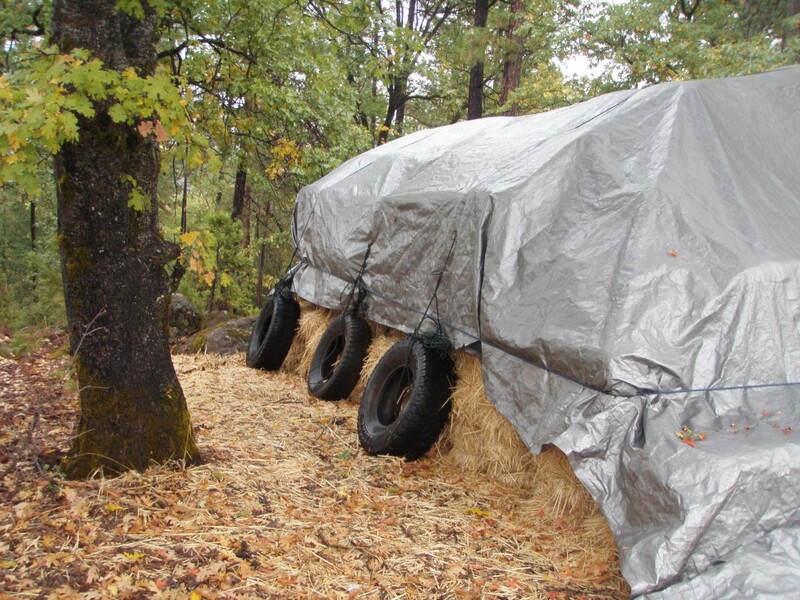 A properly tarped hay stack can withstand even high winds; if not weighted, the wind sneaks under the edges and the tarp leaves for the next county. But it’s a laborious job hauling, stacking and tarping. 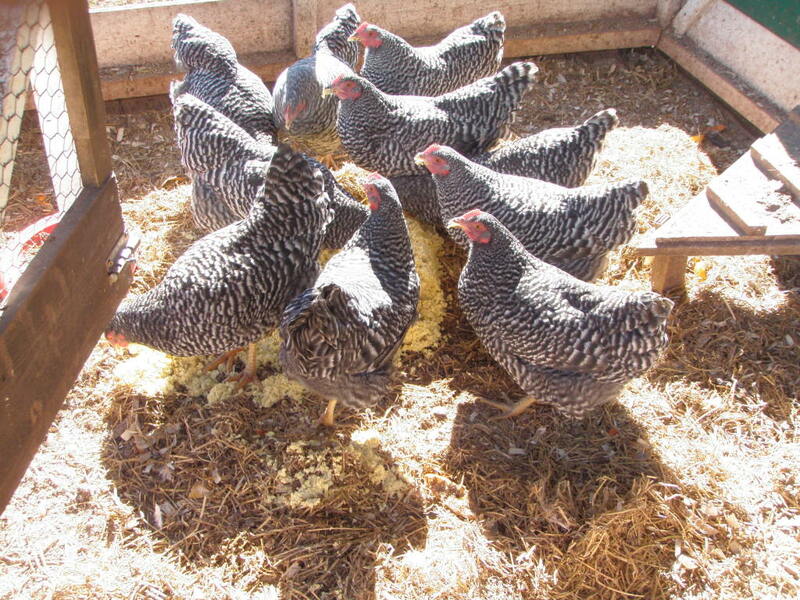 Barred Rock chickens in the chicken tractor. As far as the other critters, chickens are no big deal – we should be able to handle them and the associated chores such as bedding and coop clean-out until we need a walker. We’re still deciding whether to rebuild the pig pen and whether to get more sheep, which means a new sheep house. I suspect we’ll go on to do both, but we’re going to give some serious thought to how we site and build so we can manage them as we get (inevitably, darn it) older. 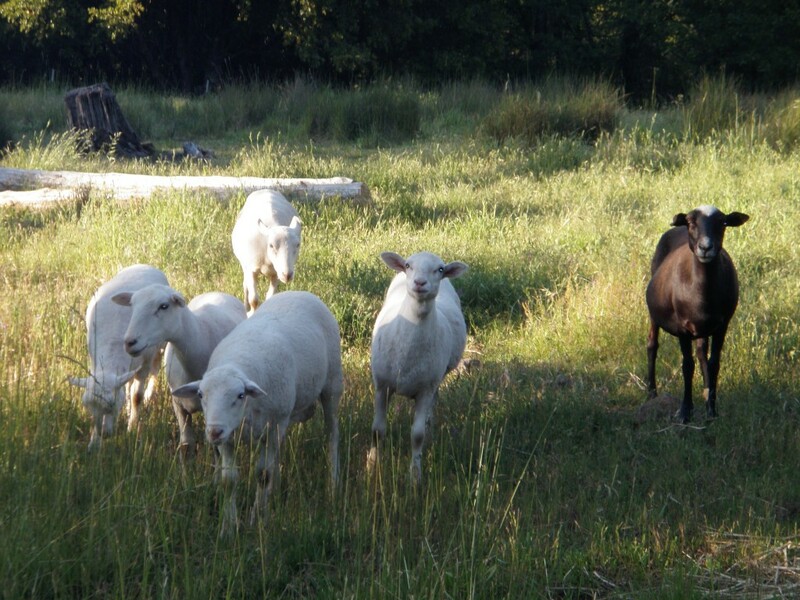 In our area, sheep that aren’t penned at night turn into cougar snacks. The year, it’s the garden that’s coming under the magnifying glass. I am finding more and more that we do better health-wise with fewer carbs. We’ve pretty much given up grains and we eat few dry beans. We’re limiting potatoes and winter squash. All of these are space-eaters and the kind of thing I wanted the big garden for. I’ve also found that short of someone camping in the middle of the big garden and shooting ground squirrels all day from April to December, a lot of what I grow in the big garden will succumb to those pestiferous rodents. It’s too far from the house for the dogs or cats to cover it, and they’d have to be there 24/7, which means they’d turn into predator meals. I’ve also found that using the methods espoused by the Kaisers means I can raise a lot more food in the kitchen garden. So the next step in my downsizing plan is to figure out how to grow even more in that spot. In addition, I’m looking at how I can get around in it when I really do need a walker. The kitchen garden is on a south-facing slope – not real steep, but it has some ankle-twisting rocks we need to dig out. I’m hoping to build two new beds. In one area that is not only on a steeper slant and has a bunch of BIG rocks, I’m thinking to recycle the big plastic tubs in which we get cow supplements. They are big enough to make a planter for something like a winter squash but small enough that I can dump out the soil at the end of the year and refill. That way I can use them for winter squash every year – the squash will ramble happily over the rocks, which I can’t use for veggies. If I dump the used soil on top of the rocks and rough spots, I’m hoping I can also seed that area with pollinator annuals rather than using precious bed space for that purpose. This entry was posted in Farms, Food, Health and tagged aging, cows, downsizing, garden, getting older, milk cow, pigs, sheep. Bookmark the permalink. Downsizing even in a small home, certainly nothing like a ranch, is still a major undertaking. We, like you, are facing the same dilemma. There is “stuff” belonging to each of our boys taking up precious space in our basement, along with “stuff” from long-deceased relatives. It’s gotta go! Gardening was lessened last autumn with the grassing over of 2 perennial beds and the amalgamation of plants I wanted to keep into the 2 remaining beds. Now…to sell off our recreational property to truly decrease the maintenance load. ….. Thanks for the good read and belated happy birthday!